Moderato assai Allegro, ma non agitato Finale: Presto The Smetana Trio’s recordings are available on the Supraphon, Cube Bohemia and TrIArT recording labels. North American representation: Kirshbaum Demler & Associates, Inc. 711 West End Avenue, Suite 5KN, New York, NY 10025 www.kirshdem.com The Smetana Trio’s 2014 tour is supported by the Czech Center New York. pianist Gregory Tucker. The Trio in D minor is concise: its three movements span only about a quarter-hour. Some have heard the influence of Haydn, a composer Martinů very much admired, on this music, and perhaps that is true, particularly in its clarity and economy of means. But all the characteristics of Martinů’s own mature style are evident here as well: the sense of constant motion, an attractive melodic sense, endless energy, and a somber coloring. The Allegro moderato is built on the violin’s rising opening melody, which rides above an active accompaniment and glides through several different keys as it proceeds. The development is active, and the movement drives to a firm conclusion. Longest of the movements, the central Andante retains some of the subdued mood of the opening movement. The tempo may be moderate, but the movement’s spiky lyricism is underpinned throughout by the accompaniment’s steady pulse. The concluding Allegro is full of bristling energy. Martinů offers an attractive lyric interlude along the way, but the energy of the opening returns to drive the trio to its ebullient close. HaaS: MULTICULTURAL SUITE Composer Roman Haas was born in 1980 in Klatovy, Czech Republic, and began playing cello at the age of 6. He continued his studies of the instrument at the Conservatory of Pilsen, followed by composition with Bohuslav Řehoř at the Prague Conservatory. Since 2008 he has devoted his attention to teaching and composing in Prague. A representative of the younger generation of Czech composers, he is known for his communicative, directly emotional style which appeals to a large spectrum of audiences, from classical to modern. Roman Haas composed his Multicultural Suite during the last year of his studies at the Prague Conservatory. The suite, as indicated by its idiomatic title, is a set of dance movements based on folk elements of various ethnic backgrounds in which Haas finds his inspiration. Each of the movement’s names captures the essential dances of different countries and languages. Each movement begins with a thematic motif which helps indicate and distinguish the cultural mimicking. SMETana: Piano Trio in G Minor, oP. 15 Smetana wrote very little chamber music—two quartets, this trio, and a set of pieces for violin and piano—but that chamber music is particularly intense and personal. It was as if he poured his enthusiastic Czech nationalism into works like The Moldau and reserved a more personal kind of expression for chamber music. His best-known chamber work, the autobiographical String Quartet No. pianists Martin Kasík, Adam Skoumal and Lukáš Vondrácek, and is on faculty at the Prague Conservatory. The Smetana Trio has toured extensively as both chamber music ensemble and orchestral soloists, working with conductors such as Jirí Belohlávek, Libor Pešek, John Axelrod, Michael Boder, Tomáš Hanus and Stanislav Vavrínek and orchestras such as the Bamberg Symphony Orchestra, Orchestra della Svizzera italiana Lugano, Orchestre National des Pays de la Loire, Prague Symphony Orchestra, Prague Philharmonic, Chamber Philharmonic Orchestra Pardubice and Moravian Philharmonic Orchestra Olomouc. 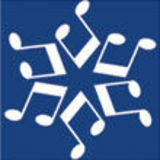 Festivals and concert series include Cambrai, Aix-en-Provence and Nice in France and München, Würzburg and Tübingen in Germany. 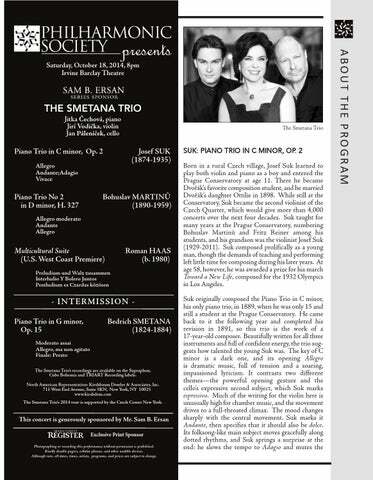 In 2011, the Smetana Trio toured the U.S., Brazil, UK, France, Switzerland, Italy and Egypt. Mr. Vodička is a permanent soloist of the Janáček Philharmonic Orchestra at home and on tour. He also performs regularly with the Prague Philharmonia, Prague Symphony Orchestra, Czech Chamber Orchestra, National Theatre Orchestra and other ensembles. His concerts are frequently recorded by Czech Radio and Television. Often a guest at prestigious music festivals throughout the Czech Republic, Germany and also in China he is soloist with the Prague Symphony Orchestra and Wuhan Philharmonia. Jirí Vodička plays an Italian violin by Giovanni Battista Guadagnini, made in Turin, 1779, kindly loaned by Florian Leonhard Fine Violins, London. With an extensive discography recorded exclusively for Supraphon since 2000, the group’s latest recording— featuring the complete piano trios of Shostakovich and Ravel—was released in March 2014 and quickly garnered critical praise throughout Europe and the United States. Its all-Dvořák disc received BBC Music Magazine’s Chamber Award for 2007 and the French Diapason d'Or. Additional discs include works by Smetana, Tchaikovsky, Mendelssohn and Schubert. Jan PálEníčEK studied at the Conservatory and Academy of the Performing Arts in Prague with Saša Večtomov and Miloš Sádlo while considering Paul Tortelier an important mentor in his early development. He studied chamber music with his father, Josef Páleníček, and Josef Vlach— first violin in the legendary Vlach Quartet. Participation in international competitions has brought Mr. Páleníček numerous awards. As a soloist he plays regularly with leading Czech and international orchestras, including the Prague Symphony Orchestra, Prague Radio Symphony Orchestra, Janáček Philharmonic Orchestra Ostrava, Lugano Festival Orchestra, Suk Chamber Orchestra, Hradec Králové Symphony Orchestra, Pardubice Chamber Philharmonic, Monte Carlo Philharmonic, Brno State Philharmonic, Bohuslav Martinů Philharmonic Orchestra-Zlín, Bamberg Symphony Orchestra (Germany), Prague Philharmonia, Moravian Philharmonic Orchestra Olomouc and KwaZulu-Natal Philharmonic-Durban (South Africa). Concert tours have taken him to numerous Europe countries as well as America, Africa and Japan and he has made numerous recordings for both Czech and internationals labels, and for radio and television. Jan Páleníček is on faculty at the Prague Conservatory and the Academy of Performing Arts in Prague. He plays a replica of the 1712 Davidov Stradivarius, made by Czech luthier Petr Zdrazil. Trio. In San Diego, the trio is joined by members of the San Diego Symphony for a special chamber music performance.